A closer look at the European star who is expected to join the Rockets for the 2016-17 season. Teams have long been stashing international prospects. The idea is to draft them in their late teens or early twenties, but leave them in Europe to develop with their specific team or country. This allows the player to continue developing and honing their craft in a comfortable environment where they have the support system to help develop consistency in their skill set. That’s exactly what’s happened with the Rockets and Alessandro Gentile, who is rumored to be potentially joining the Rockets this season. 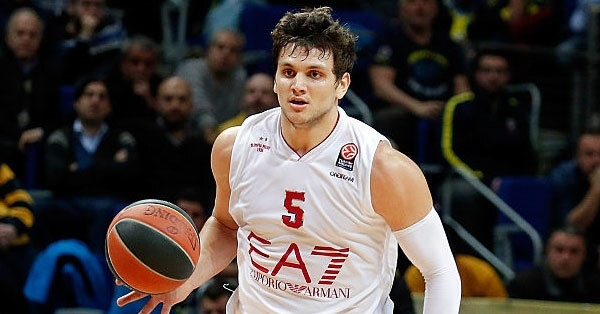 Gentile, who was selected with the 53rd pick in the 2014 NBA Draft, is a 23-year-old small forward and shooting guard who has averaged double figures in Euroleague competition for Italy and in the Italian league Serie A. As such, a case can certainly be made that Gentile is ready for a higher level of competition. In Houston, fans are hoping to see the team bounce back from the disappointing 2015-2016 campaign. But after the mildly surprising hire of Mike D’Antoni as head coach, some are skeptical on whether steep improvement can be made. No matter what, in order to be successful, a team needs to surround its head coach with players that can star in their role. 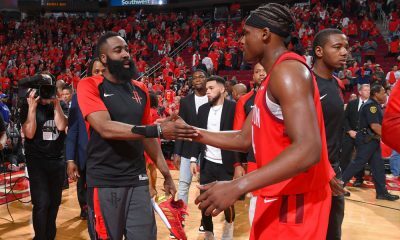 The Rockets have numerous complementary pieces that need to integrate, not assimilate, in order to create true chemistry on both ends of the floor. This 6-7, 230 pound Italian has a specific skill set that can infuse the Rockets second unit with scoring, shooting, and playmaking. 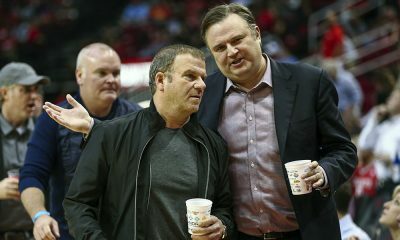 The Rockets need players who can facilitate the offense and play a certain role in the read-and-react and spacing system that Coach D’Antoni will implement. Gentile is a physical player, using his footwork and length to create scoring opportunities. He’s able to score and facilitate movement with and without the basketball. That last point is important, especially with a Rockets team that will attack defenses after forcing miscommunication and mistakes. Gentile prefers to attack off the dribble and has the ability to use both his hands when finishing around the basket. 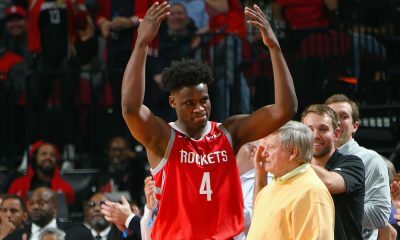 With the Rockets, he won’t likely be the primary ball handler whenever on the floor, but don’t discount his ability to attack closeouts and beat bigger defenders off the dribble. Here’s an example of Gentile attacking Jae Crowder of the Boston Celtics during a 2015 NBA Global Game. 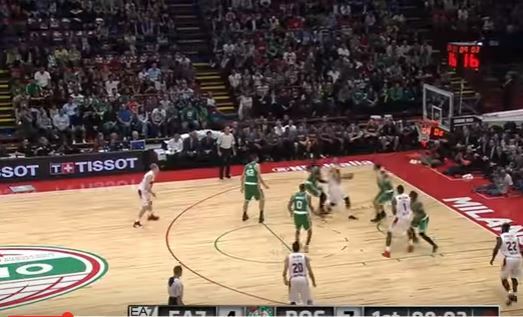 In D’Antoni’s offense, there are two shooters camped in the corner, one shooter in the slot and the ball handler and screener on the angle. 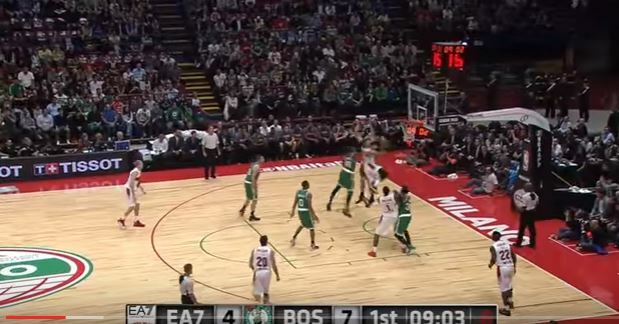 The slot is theoretically the opposite wing of the pick-and-roll ball handler. The angle is defined not as the middle of the floor, but slightly adjacent to the wing. With three shooters on the floor, including the power forward as a stretch forward, there’s enough spacing to run a spread pick-and-roll and attack inside. Notice Gentile is in the slot position. Once the ball-handler makes the pass to Gentile’s side, the team clears the left side to let him operate. Crowder allows the baseline, not willing to give up the inside elbow and middle of the floor. Gentile immediately attacks Crowder and begins his drive towards the lane. Gentile, as many savvy European players do, uses his inside shoulder to create space and contact. He has great body control, attacking closeouts and using both of his hands to produce variety of finishes around the basket. With his physicality, Gentile seldom resists contact and often uses space well to finish past defenders who rotate over to protect the paint. David Lee rotates over to help, but Gentile plants his left foot and uses his right foot to balance himself in the air, ultimately finishing around Lee and the outstretched arms of Crowder. Gentile has a stronger upper body compared to most European wings, however he’s very slow and methodical in how he attacks off the pick-and-roll, off screens, and most close outs. His 6-7 size will allow him to play the shooting guard or small forward position off the bench for the Rockets. There will be opportunities for him to attack mismatches against smaller guards from opposing teams. A strength of Gentile’s is his ability to get the ball in the post and either score/facilitate off face-up or post-up possessions. He’s a master at manipulating his pivot foot and body to contort in ways to bypass his defender and score inside. He can also utilize his underrated passing ability to create scoring opportunities on the opposite side of the floor. This past season (2015-2016) for EA7 Emporio Armani Milano, Gentile had an AST% of 24.08 (AST% is the percentage of teammate field goals a player assisted on while he was on the floor). Therefore, Gentile assisted on almost 25% of his team’s field goals. Incredible numbers that indicate that he has the ability to facilitate the basketball and create opportunities in a spread pick-and-roll offense. Here’s an example of his post game against smaller players. Notice how he uses the drop step as a counter to the smaller guard who aggressively attacks Gentile’s right hand. The drop step allows Gentile to maintain positional and size advantage over smaller defenders, and his leg, hip, and waist ultimately mitigate the defender’s capability to alter or block the shot. 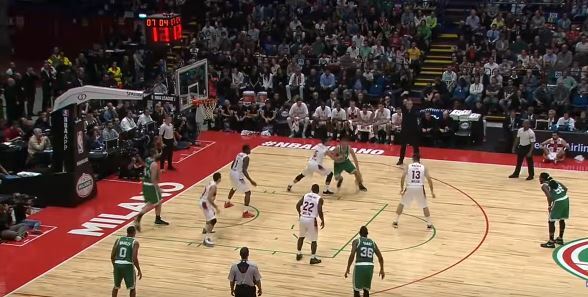 In this play, Gentile uses his drop step to pivot around towards the baseline and release a hook shot with his left hand (he was also fouled). As was mentioned before, he is ambidextrous with the basketball when around the basket and will use it to his advantage. Coach D’Antoni will look to utilize Gentile’s post-up play in pick-and-pop and pick-and-roll situations where Gentile can play the screener or ball handler. As for Gentile’s passing, here’s an example where hedging is used on the screen and Gentile must recover and make the correct decision. 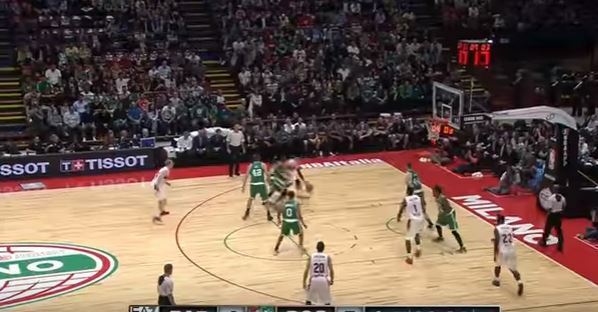 After Gentile is contained by the defense hedging the screen, he’s still able to make an accurate bounce pass to his Big inside for the slam dunk. This skill will surely be utilized in D’Antoni’s offense, which relies heavily on players’ abilities to read-and-react and make passes to keep the offense moving and the defense from attacking passing lanes. 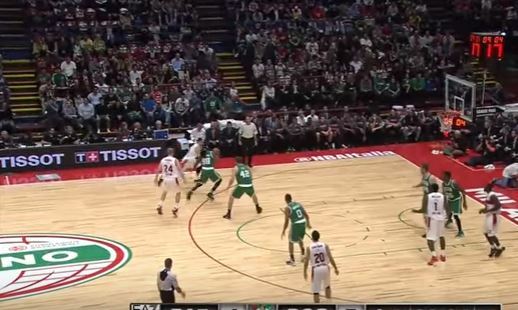 The spacing created from shooting and proper lineups will allow Gentile’s strength to shine. Perimeter passing and cross-court passes to the corners are where Gentile excelled with his Italian team, opening up three-point high percentage opportunities. His lack of athleticism and explosiveness off the dribble will create problems for him offensively, but his high basketball IQ and ability to attack closeouts will provide fresh scoring to this Rockets team. Offensively, he struggles shooting the basketball at a consistent rate. He was a 24.3% three-point shooter this past season, struggling at finding rhythm from the perimeter. He needs to improve the mechanics of his release, giving his shot more arc and better accuracy. Defensively, he struggles against stronger and faster players due to his limited lateral quickness. When placed in isolation situations, Gentile struggles to stay with his assignment and will likely be picked on in pick-and-roll defense situations. He’ll likely play the passing lanes when/if the Rockets trap pick-and-rolls and try to force offenses into rushed turnovers. Gentile will also need to learn how to defend without using hands and reaching. He does have quick instincts and creates steals, but the NBA level will punish him and yield a high foul rate. Look at Gentile using his arms and trying to reach into David Lee’s body to force a turnover. Luckily for him, a foul was not called, but Lee was able to get past Gentile and pass to Bradley in the corner. This will be an area of emphasis for Gentile and the Rockets coaching staff this upcoming season. As an offensive weapon and scorer, Gentile will surely be utilized by Coach D’Antoni and the Rockets coaching staff. What will determine his playing time and impact on the team will be his ability to improve defensively and provide enough offensive spark as a rotation player to offset his weaknesses. His passing, shooting, and craftiness as a facilitator will provide another component of the spread pick-and-roll attack. Lastly, I would like to introduce myself to Rockets fans here on ClutchFans. My name is Alykhan Bijani, you probably recognize me as @Rockets_Insider on Twitter. 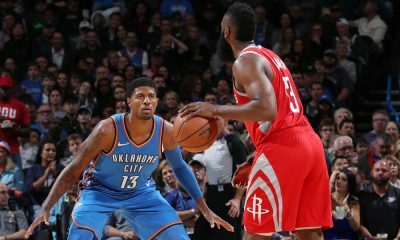 I cover and write about the Rockets for ESPN975.com. I also write about the NBA for Hardwood Paroxysm. I’ll be contributing to ClutchFans throughout the offseason and into the 2016-2017 NBA season. Looking forward to sharing my thoughts and film analysis on all things Houston Rockets. 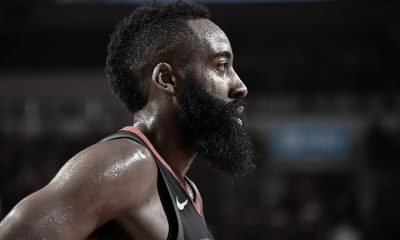 Look out for a Mike D’Antoni Houston Rockets playbook in the coming weeks that will detail multiple sets and plays the team will utilize with Harden and the rest of the roster.